1However, the Fairy Realm is in close contact with the Material World where we live in. Fairies. Winged, cheerful and wonderfully enchanting entities which have long been associated with the forces and elements of nature since antiquity. The Kingdom of Fairies is a completely different Realm often called the Ethereal Plane. However, the Fairy Realm is in close contact with the Material World where we live in. The difficulty to reach another plane, is based on our ability to expand our consciousness. The Ethereal Plane is amongst the ones which can easily accessed. The Astral Plane, for example takes a bit more effort for humans to be accessed. Many of us were born with the Ability to travel to other Realms with no effort at all. In Ancient Religions, it was believed that the Children who born on Imbolc (from January 31 to February 2) were natural born travellers to the Land of the Fairies. However, others don’t know they possess this ability. The Travellers can either be born, or be trained. Shamans for example, the Priests and Priestesses of Animism and Nature, are trained Travellers. The Kingdom of Fairies includes both Male and Female entities although many traditions describe that the Kingdom is reigned by a Queen. Since none of these assumptions can easily be proved, I truly believe that there are several kingdoms of Fairies, similar to the countries of Human Race. Some more benevolent, others more maleficent. Spotting Fairies is believed to be difficult because we try to actually “see” them as we would see some birds or butterflies. Even though this could also be achieved, it’s easier to perceive or to sense the presence of fairies by expanding our consciousness. (See here more in the Initiation in Fairy Witchcraft). In this article we are going to describe ways that fairies try to establish contact with humans. Personally, I am pretty sure that almost every human has felt the presence of fairies even if we easily forget or neglect it (either by fairy magic – as fairies mostly try to avoid contact with humans – or by our ignorance). 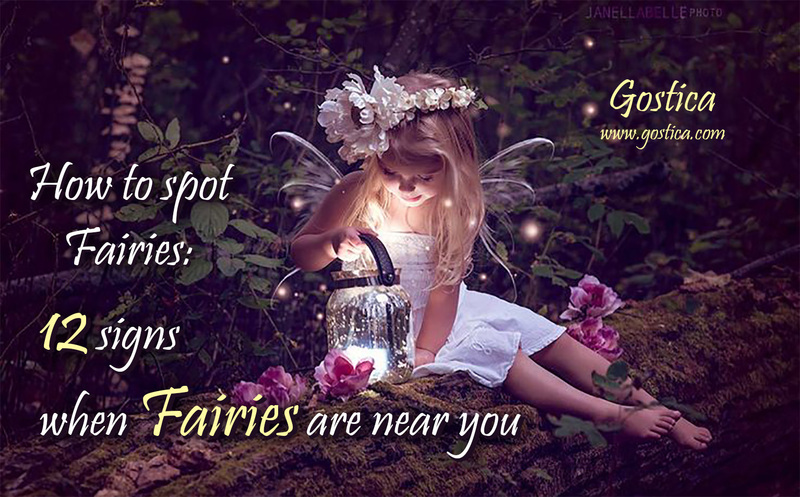 One of the most common ways fairies and other ethereal beings are noticed, is as spheres, flickers or glints of light. It’s very common to see it around mushrooms, blooming flowers and springs. People associated with fairies (children of fairies) can watch these lights anytime. You may also notice unexplained movements out of the corner of your eyes. Once you’ve entered the fairy Realm nothing is the same. Soft sounds may greet the strangers who enter the fairy land. Whether it’s the sound of various wind instruments – like the flute – or a simple sound – like the welcoming sound of tiny bells – it’s absolutely the same. Allegedly, if you ring a bell over a spring or pond you may see the reaction of fairies responding to your invitation. It’s long believed that fairies love to sing and dance at night. They usually dance around a circle. Many who stay in forests at nights claim to have heard wonderfully enchanting songs, while later in the morning they find mushroom circles, circles of flowers or trace of footprints of human-sized nymphs dancing known as the Fairy Rings. Many believe that the “Fairy Rings” are the Gateways to the Fairy World. Respect the fairy rings and always ask for permission before entering the Circle. Do NOT cut any flower or mushroom from a fairy circle! As Fairies are – almost always – described as cheerful creatures, when you are close with these entities it very likely to hear laughter or feel the urge to laugh. The feeling of joy fills your heart and lasts long! You are walking down a path, or even a road while your nose is filled with an overwhelming scent of flowers like Iris or Violets, or even the scent of the grass like it just rained or maybe it smells like walnuts, apples or grapes. As fairies are often associated with flowers, plants and trees, this could be the work of a playful Fairy sprinkling scented fairy dust to you, blessing you or trying to catch your attention.